A mystery object in house dust. Found the source of the object! The image shows a strange looking object which in the dust of my apartment. What could it be? One thing should be clear: it’s biological origin, otherwise I can not explain its regular structure. The bottom image is a stack of several individual images to increase the depth of field. I also performed a color adjustment to increase the contrast. The round spherical structure above the date is an air bubble. In order to find out more about the structure, I posted a comment on a German microscopy forum, and I obtained some interesting responses. Apparently it is a bristle of an insect larva of Anthrenus sp., according to one member of the (forum). 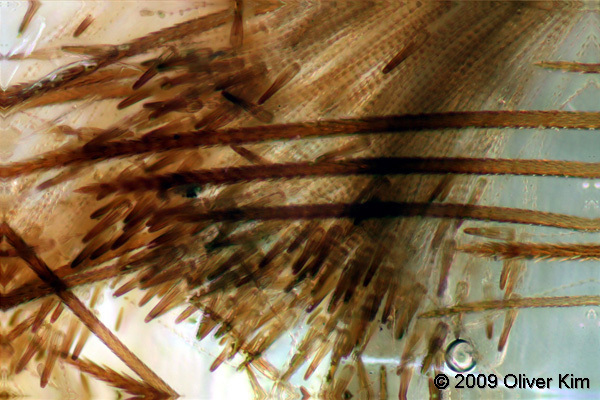 And indeed, another check of the dust turned up an empty exoskeleton of an insect, with a large number of bristles. The same structure was also seen by another microscopist here. 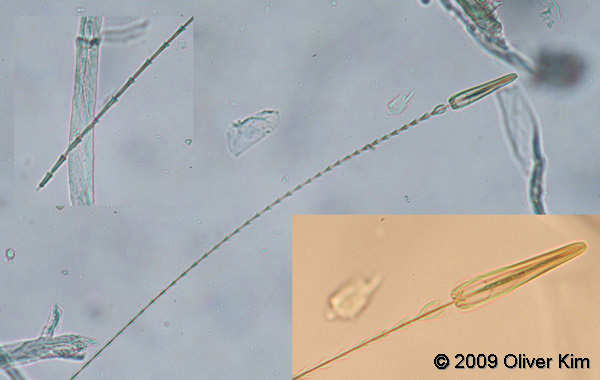 Anthrenus sp. is also known as a “carpet beetle”, and is known to eat textile material. Not a good thing to have it around in a household.